The call to photograph demands a photographer to react with spontaneity, vigour and intuition to record the observed moment. As they go into the world and seek out subjects of interest to make into photographs their operational mode could probably be described as that of the hunter-gatherer. Photographers like Elliott Erwitt, Robert Frank, Ansel Adams, Faye Godwin, Helen Levitt, William Eggleston and Martin Parr have shaped the history of photography using this mode of working. The quest undertaken by these hunter-gatherer photographers is to capture from the world something that is invisible or unseen in everyday life. Then there are other photographers that are not content with just photographing what is before them, and as such are compelled to create their own realities to photograph. These constructed tableaux can combine disparate elements that may never have physically or metaphorically co-existed, presenting visual challenges and conundrums to those who look at these photo-fictions. Australian born photographer Jackie Ranken, now living in New Zealand, is somewhat a photographic chameleon as she can manoeuvre between the two image-making styles with ease. Regardless of her mode of working Ranken’s photographs consistently present new and unique images of the world to inform, surprise and inspire the minds of the both the photo-specialist and public audiences. The body of work that first brought Jackie Ranken to national prominence was a series of aerial photographs reinterpreting the Australian pastoral landscape. Ranken made these images precariously strapped into a Gypsy Moth bi-wing aircraft flown by her father. Aerobatic manoeuvres were required so that a straight-down view could be imaged without wing tips and struts. The result of these hair-raising flights was tightly composed photographs of landform details. Devoid of the references of perspective and horizon that viewers usually need to make sense of the landscape, these images presented visual cryptic patterns of the land rendered as geometric, non-representational shapes–patterns of cattle and sheep tracks, fence lines and the twist of a stream’s course. The viewer metaphorically flies above unfamiliar terrains visually seduced by the intricate beauty of these abstract landforms. While this body of work may fit comfortably with the idea of the hunter-gatherer photographic mode, Ranken also purposefully constructed a space for her images to be created. She was not a casual observer waiting for the moment to capture her subject, but rather she provoked the landscape to reveal itself through her unusual viewpoint and representation. The chameleon photographer that is Jackie Ranken has embraced many of the more traditional genres of photography including press photography, photodocumentary and travel or destination photography. 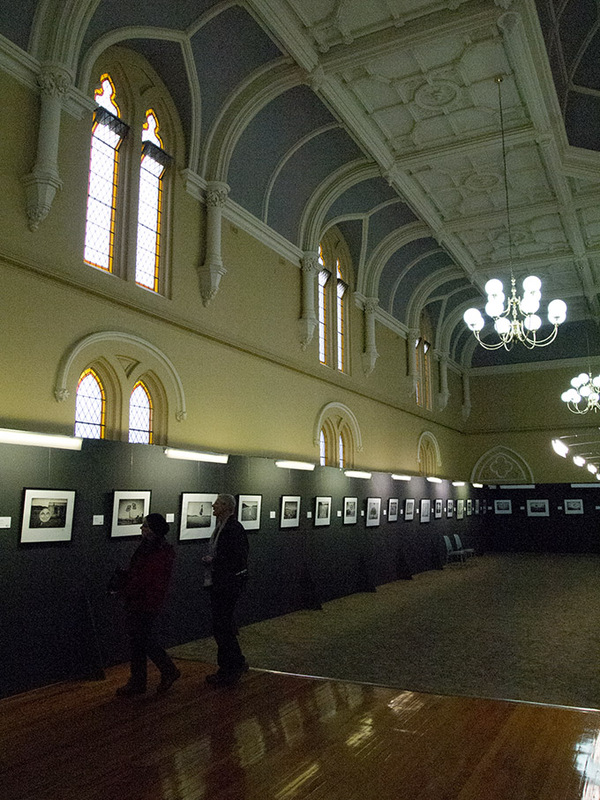 Always present in her photography is an edginess that takes the viewer into new and exciting visual territory and the body of work presented in this year’s Ballarat International Foto Biennale is no exception. In her Kitchen Stories and other realities Ranken employs the New Zealand landscape as a stage in which many players or objects are cast. The landscape backgrounds selected by Ranken are often in themselves places of natural beauty – snow-capped mountains, barren grassy hills and clear watered lakes … until the landscape’s seemingly still and quiet nature is interrupted by flying objects that come across the field of view and grab the viewer’s attention. These unexpected and incongruous objects, now frozen in time and space, hover motionless over a monochrome landscape. 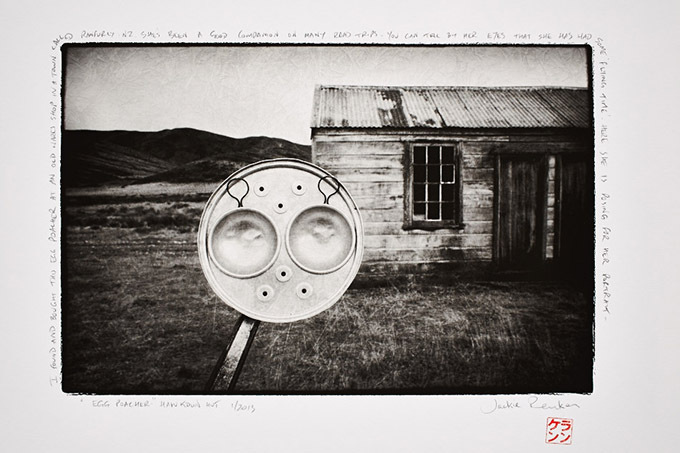 An antique aluminium two-egg steamer pops up before a rustic country shack in field of tussock grass. In another image, located on a beach a drop-sided toaster and power cord snake serpent-like across the foreground perhaps as the Manaia of New Zealand Māori culture. The design of the objects, their attitude in flight or physical placement in the frame, often imply a face in particular–the eyes, but as you allow imagination to take hold other features emerge. Robotic, alien (from outer space), drone-like apparatus and contraptions appear. In some images the similarity of object and location seem to connect with some kind of loose logic. 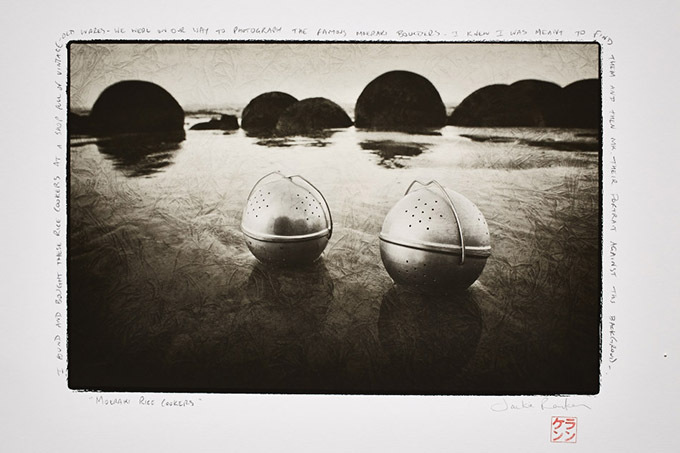 Aluminium rice steamers have landed on earth and attempt to mimic the Moeraki Boulders behind them–hoping, maybe, to go unnoticed. Yet in other photographs, such as ones in which forks, with tines pointed skyward, emulate a miniature steely massed forest. The mysterious presence in Ranken’s photographs is further enhanced by her warm tone, sepia treatment of the images. Adding to the visual presentation of the photographs is the use of a dark border and veil-like texture screen. These techniques enable the normal colour and tone rendition of the subject to be transformed into an image that invokes fleeting memories and dreams. 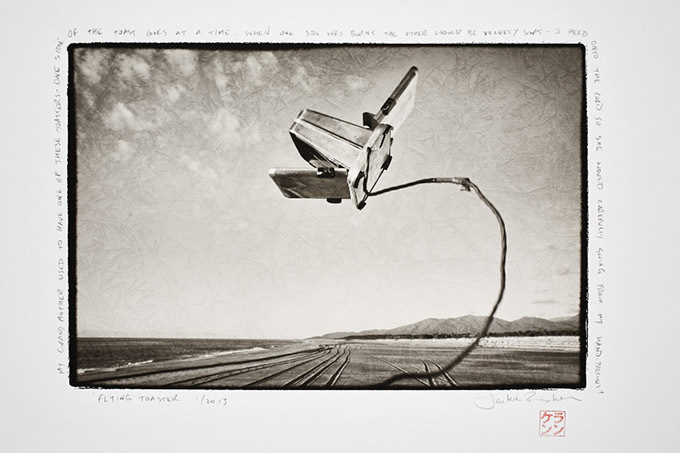 Anecdotes in the author’s own hand surround the image to recount Ranken’s connection with the object and the circumstances of the photo-making encounter. Through the visual narrative of Kitchen Stories and other realities, Ranken constructs visual communiqués to connect the viewer with their memories and experiences and to encourage a heightened awareness of the ordinary things that surround their everyday life. In the captured ephemeral moments of flight Ranken presents the viewer with an opportunity to contemplate these objects of everyday experience. Ranken comments in her artist’s statement, that the Zen philosophy of Shibui informs her approach to life, and therefore she seeks to create images that present glimpses of a world where beauty can be found in simple and mundane objects. What meaning should the viewer take from this? Are Ranken’s flung kitchenalia also a personal rebellion against homecraft and the traditional expectations of the housewife? Could it be a fascination with flight? Or is it that Ranken is a visual provocateur? In her artist’s statement the latter seems to be her strategy and it’s up to us to make sense of these incongruous apparitions. At first there may be a resistance to engage beyond the whimsical nature of the work. But these photographs deserve close and extended viewing, if not only to satisfy our curiosity for what has been presented to us, but also for what we may discover about ourselves, and the connections we make with the world. BIOG: Doug Spowart is an artist, photographer, lecturer and artists’ bookmaker. With over 30 years continuous involvement in his art practice he has exhibited widely and his work is included in major gallery and library collections. Spowart has a PhD with his main research interests in both the photobook and social media. This text is licensed under a Creative Commons Attribution-NonCommercial-NoDerivs 3.0 Unported License. Very inspirational work. Jacki has such wonderful energy. Thank you for sharing this – such a wonderful article to read.